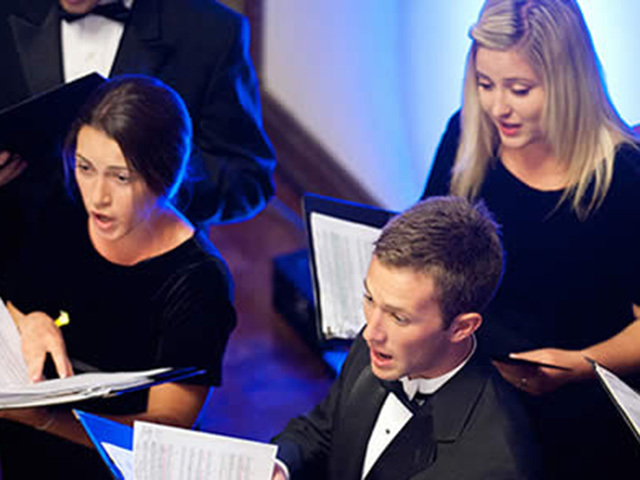 USD's Choral Scholars is a vocal ensemble composed of select students of high academic caliber and possessing exceptional vocal ability, coupled with a unique scholarship program. The Choral Scholars perform at university and community functions, performance tours and university concerts. The Scholars are available for both university functions and outside bookings, and maintain a repertoire that ranges from madrigals and motets to contemporary gospel, avant garde and popular music. The University of San Diego's Choral Scholars is a vocal ensemble of musically gifted students of high academic caliber. Founded in 1989, this elite choral ensemble of music majors and minors specializes in the performance of contemporary and early repertoire for the chamber choir. The Choral Scholars is one of the few collegiate choral ensembles in this country to fund every member with an academic scholarship. Beyond the financial award that is applied towards tuition expenses, students in Choral Scholars receive private instruction in voice, advanced choral training, ongoing music theory development and numerous performance opportunities. Under the direction of Emilie Amrein, DMA, the Choral Scholars rehearse for five hours each week, with additional individual and sectional practice sessions arranged around student schedules. The ensemble maintains a busy performance schedule, appearing in two to three full concert performances each semester in addition to many smaller appearances at official USD functions. In recent years, the Choral Scholars have toured Italy, France, Poland, Hungary, Russia and the Czech Republic. In addition to their rehearsal and performance duties, the Choral Scholars serve as soloists and section leaders for a variety of ensembles on campus and in the greater San Diego community. These additional leadership roles provide a robust pre-professional performance experience with some of the community's most highly regarded performing organizations. Membership in the University of San Diego Choral Scholars is contingent upon an audition and interview each year. For priority placement, prospective high school students should submit an unedited web-based, video recording of two contrasting art songs accompanied by piano by February 1. One of the two selections should be in a foreign language. Students selected to advance to the next round will be invited to campus for an audition and interview in March. Remaining awards and positions in the ensemble will be awarded on a rolling basis. Our 2017-2018 roster has been filled. Please contact Dr. Emilie Amrein for further information at choralscholars@sandiego.edu.